If I had to choose a favourite part of this years TGO route I’d take liberties and say the whole of the middle four days. But ahead of those there was the matter of that appalling weather which had arrived on day 3. It was still there thrashing around my tent as I awoke on day 5 and showed no signs of blowing itself out yet. The overview map for days 5 to 9 is below and again I’ve shown the changes I made to the route along the way. The route I eventually followed is shown in BLUE, with any original parts I changed shown in GREEN. I didn’t take a single photograph on day 5, my memory is all that remains of an extremely wet, cold day . Throughout the previous night the weather had worsened with extremely strong winds blasting sleet and rain up Glen Coe, making my tent do a merry dance. I peered out of the door several times in the early hours only to see horizontal hail blowing past, and absolutely no sign of the majestic mountains around. 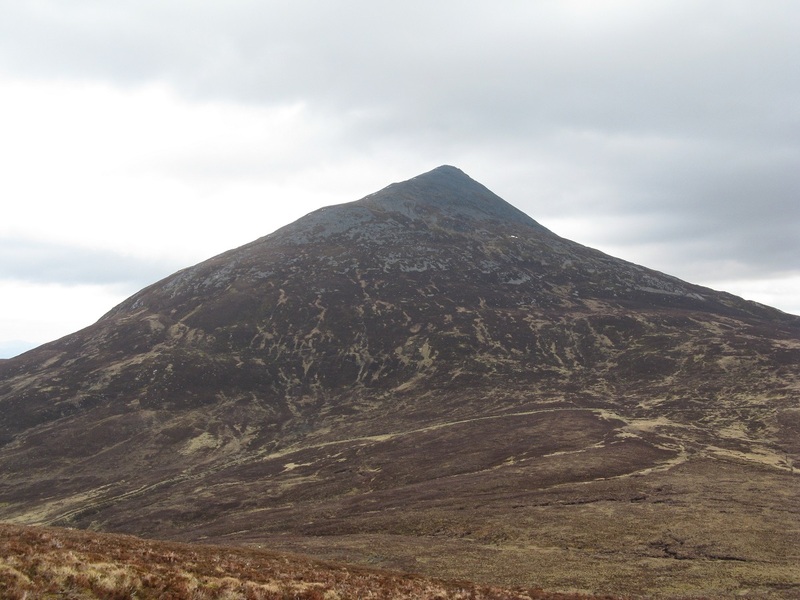 The plan to traverse the Black Mount over to Bridge of Orchy was absolutely out of the question, it would be baltic up there. So resigning myself to my FWA of following the West Highland Way (WHW) backwards for the day, I started packing. 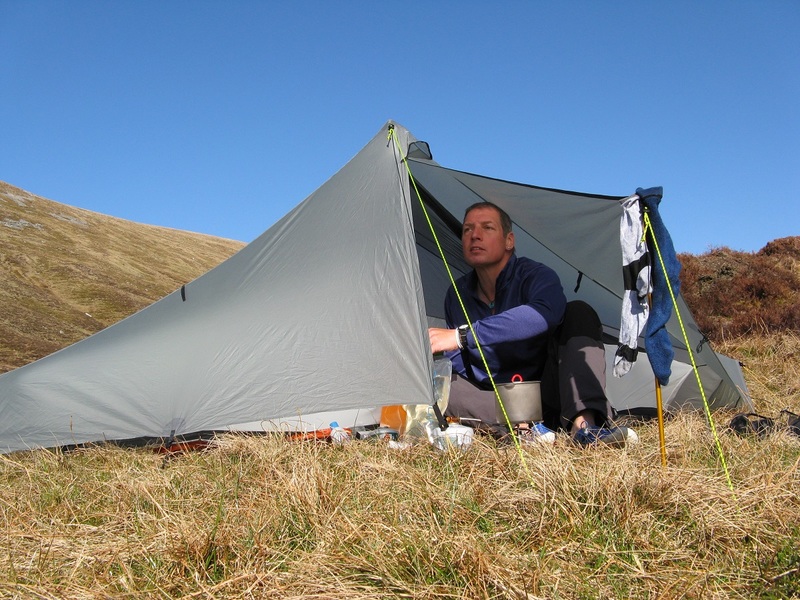 I eventually braved leaving my tent at 09:00, a late start for me, and quickly struck camp. By the time I’d stuffed the tent in my pack I was drenched. I nipped over to tell Julie Harle from Kentucky, who had pitched close by, my plans and left with an incredibly sore throat after having to shout over the noise of the wind. As I walked off past the Kinghouse hotel I passed Peter ‘Lilo’ Varley’s tent which looked like it was only being held down by him still being inside it. The rest of the day was an easy if damp walk, with absolutely no view to speak of as I walked into the wind and rain with my face to the floor. I’m not a great fan of the WHW, it takes a rather tame line, but of all it’s sections this is the best across a corner of Rannoch Moor at the foot of the majestic Black Mount range. 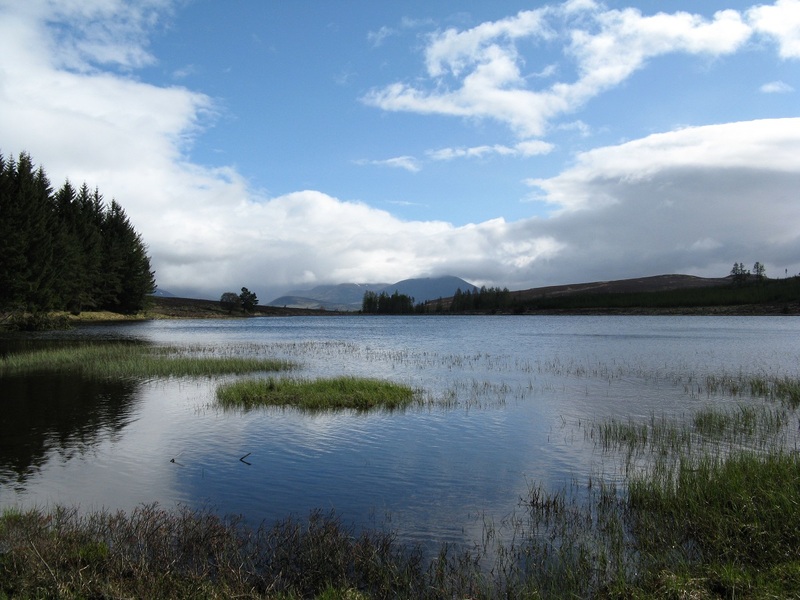 High peaks rising to your right, and incredible sweeping views across Rannoch moor on your left. But I saw none of it, completely shrouded by a wall of icey wetness. Following the course of an old military road here, there’s also a distinct lack of shelter along the whole section. The slight downside of using a stretch of the WHW is that for an hour your path meets with a sea of backpackers coming the other way along the route, but it doesn’t last long. They all seem to set off at the same time and walk as a gang. I arrived in Bridge of Orchy in double quick time and decided to see if there was a bed at the West Highland Way Sleeper bunkbarn at the station. For anybody with the same idea, I couldn’t recommend it. In fact I’d recommend you stay well clear. I phoned the people in charge from the station and a helpful message said that somebody would get back to me within 3 days !! When I peered through the window the place was a disgrace, more like a bad student squat. Discarded clothing and dirty bed linen lying about, and a kitchen and dining room full off unwashed crockery, pans and food scraps. Needless to say I walked away. What a difference a day makes. The wind had blown itself out and the rain tap had been turned off. It was time to get back to those hills. 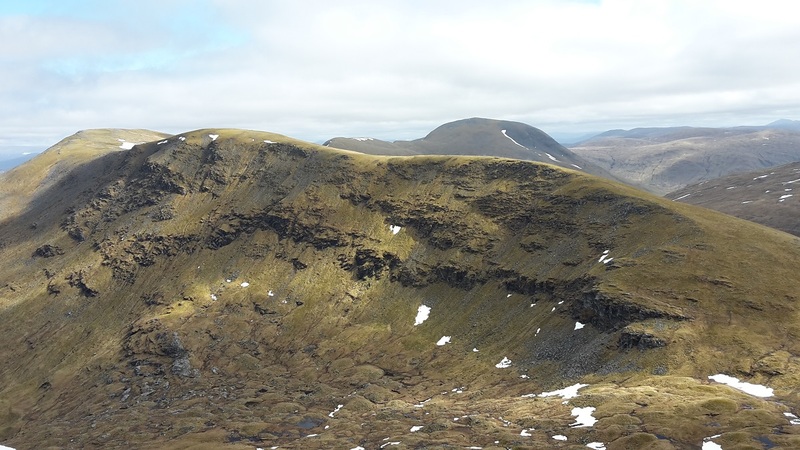 Todays target was the Bridge of Orchy Munros, or at least four of the five of them. And I can’t recommend this wonderful group of mountains enough. They come easily once you’re up there, and on a good day they give fantastic views. You start with a climb up to Coire an Dothaidh, which isn’t too steep, and from there the drops between each of the Munros aren’t what I’d call significant. Not by Moidart Corbett standards anyway. For the first (Beinn an Dorain) I dropped my pack at the Coire and did it as an out and back . Admittedly there are a few false summits on the way up and it took rather longer than expected (1 hour 20 mins), but it would have been a shame to miss it out while I was up there. It’s also a bit more rocky than the other tops here. Once back down to the Coire the second munro, Beinn an Dothaidh, comes very easily. 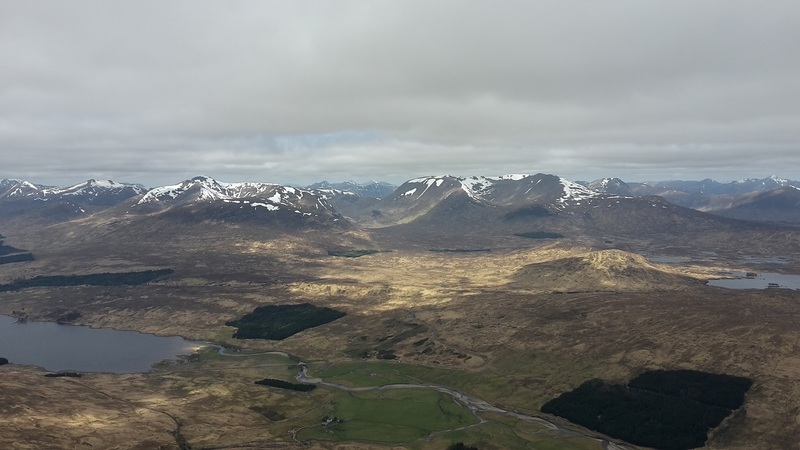 And with it come the most amazing views over Rannoch Moor and Glen Coe. If you come this way pray for clear day and you will marvel at the vista. I could have sat up there all day. 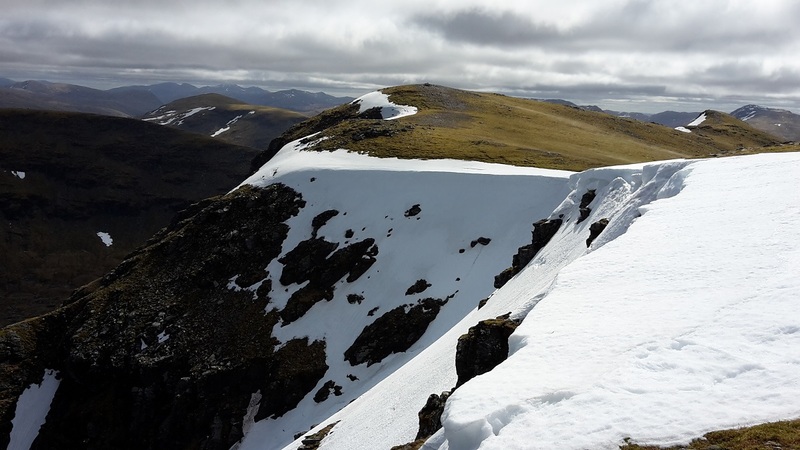 From Beinn an Dothaidh you drop sharply towards a wonderful broad grassy ridge which rises gently towards Beinn an Achaladair. On the way down to the ridge the steep descent was blocked by a substantial patch of snow lying at a precarious angle, so a bit of care was needed here. And here you get your first views of Loch Lyon and the head of Glen Lyon down to your right, my intended camp for the night. First though there’s the little mater of those other two munros. The whole walk along here is wonderful, the sort of walk that comes effortlessly once you’re up there and just enjoying it. You don’t have to watch your feet, you can just concentrate on the scenery. The broad ridge has sections of rock pavement, and the views down and across to your left show you just how vast Rannoch moor is. It’s like looking out over a vast relief map. 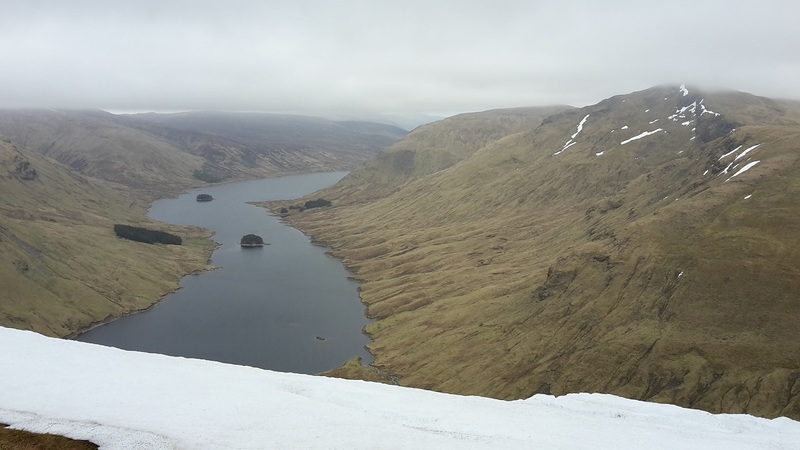 From the last munro, Beinn a Chreachain, you initially head north down a grassy ridge before turning east to make your way over a rough and steep pathless descent down to Allt Meurain which leads to Loch Lyon. The sun was out, the wind had gone and I was having the time of my life. It’s possible to take an easier low level route to Loch Lyon from Bridge of Orchy and miss out this fine group of hills, but if you’re coming this way I’d really encourage you to pop over the munros, it’s a glorious walk. 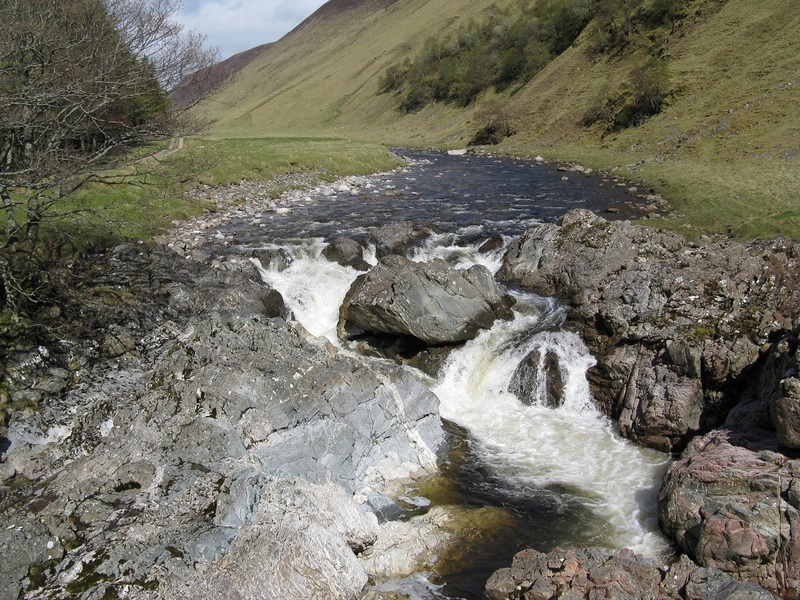 And it’s of course possible to then walk all the way down Loch Lyon and down Glen Lyon to Bridge of Balgie. I had other ideas however. The original intention had been to cross through to the head of Loch an Daimh via Craig a Chabrainn, but after using a couple of foul weather routes through Glen Coe I really wanted to keep going high and there are munro and Corbett possibilities on the ridges either side of Loch Daimh. So I decided to camp at some shielings close to Loch Lyon, giving me the option of going high in the morning if the weather held. 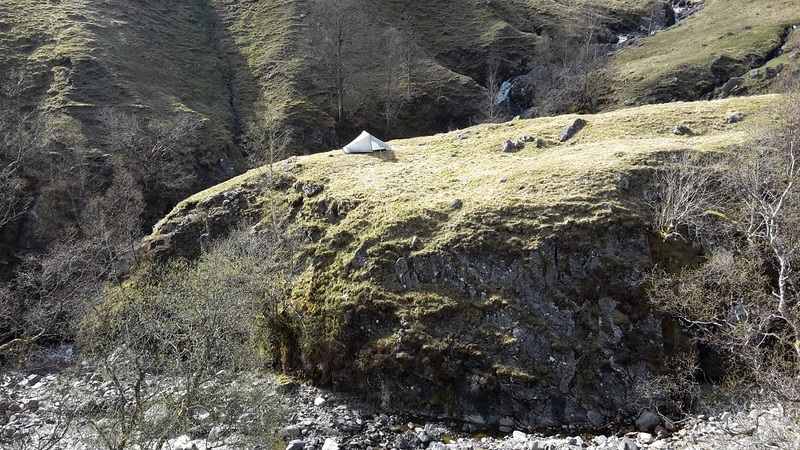 And what a place to camp at the end of a superb days walking, pitched high on a promontory perched between two cascading streams. It was a superb spot with views down to the Loch and mountains beyond. Day 7 dawned cool and grey, but windless and dry. Perfect for going high again. As I washed my pan before setting off I glanced across at a small tributary feeding the stream I’d collected water from only to spot the carcass of a decaying sheep lying in the middle of it. It was stupid of me not to notice it when I’d camped the nighty before. but luckily I’d taken water from above the point where that flow entered. Lucky indeed. Colin Crawford, my vetter, had mentioned a Corbett just off my intended route which he said should be easy if I still had the legs for it. I have to say that it was a little less easy than expected as a first aim of the day, with a good km of peat hags to get across before the climb up. But once up there I was glad I’d changed my route to go high again. And from there, with great views down over Loch an Daimh, it was an easy decision to carry on along the tops to take in another munro, Stuc an Lochain. In fact I didn’t even know it was a munro until I passed an access noticeboard down at the dam at the end of Loch an Daimh. That was quite a bonus and had me grinning all the way down into Glen Lyon. 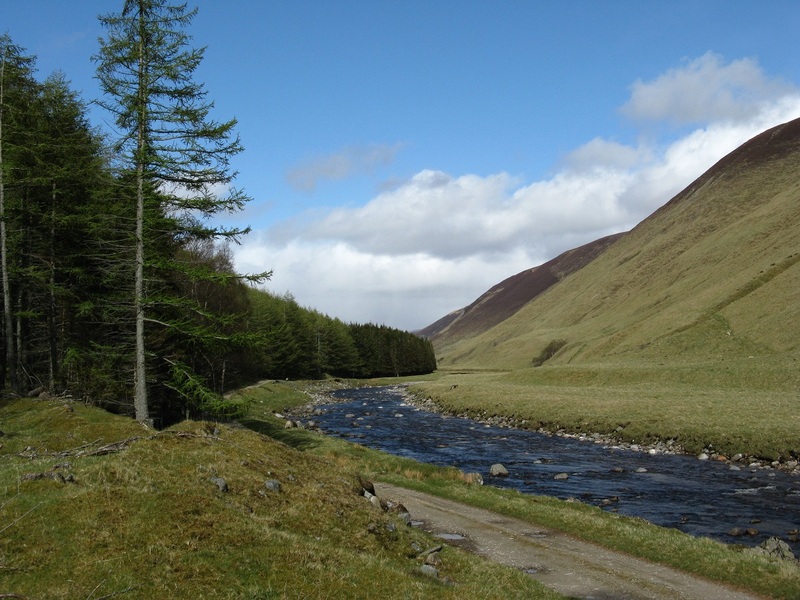 Glen Lyon is a real gem. Wonderful native tees lining a wide glistening river, amongst almost manicured farmland. It feels locked away, kept a secret almost. By now the sun was out and the day was really warming up, I thoroughly enjoyed the change in surroundings. I couldn’t quite believe that I was walking through this area with it all to myself. 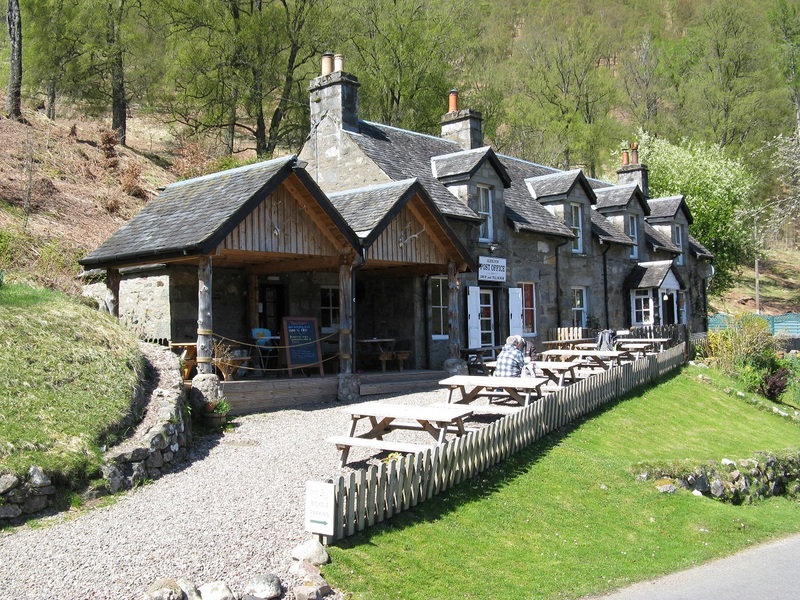 And the cherry on the cake, the Glen Lyon Tea Rooms at Bridge of Balgie which I arrived at in perfect time for a spot of lunch. I sat outside in the midday sun, listening to the river and birds, whilst eating homemade soup and fresh bread…. and had a second pot of tea just to give myself an excuse to linger awhile. Strange, it’s pretty much the only building there, in the middle of nowhere. The Tea Rooms also serve as a small shop (just a small selection of essentials, first aid etc) and sub Post Office, and my wife had posted a spare camera here several days earlier. It had arrived safely so I packed the broken one up and posted it back in return. It was home the next day. You can walk down the quiet lane after the Tea Rooms or, as I did, take a path from behind the tea rooms through a lovely spruce woodland to meet with a track which climbs up the Lairig Gallabhaich. 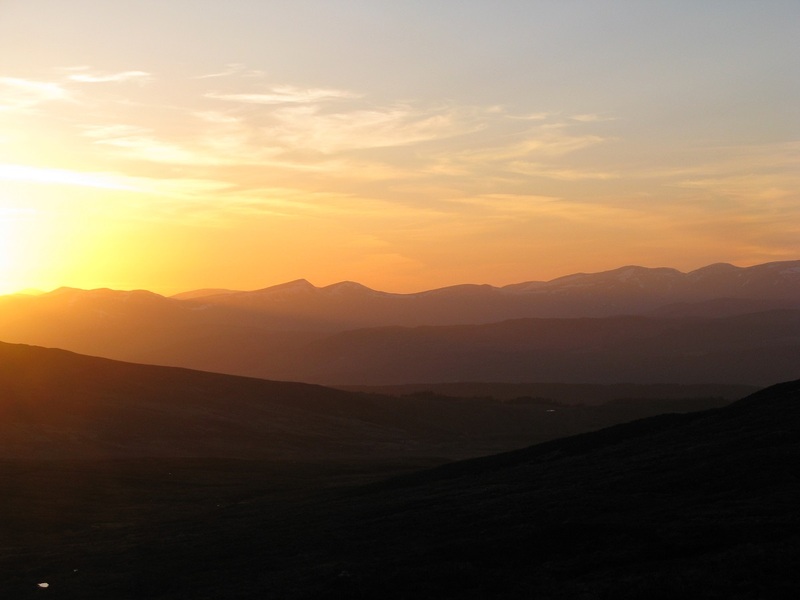 This gently rising track can take you all the way over to Loch Rannoch. 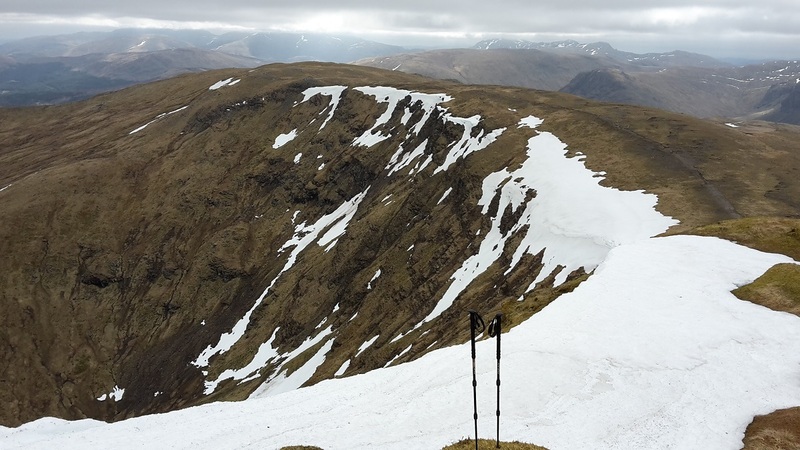 I followed it to it’s high point and used it to access the Munros north of Glen Lyon. From the track’s highpoint I struck east over trackless ground to a bealach between Carn Gorm and Beinn Dearg. 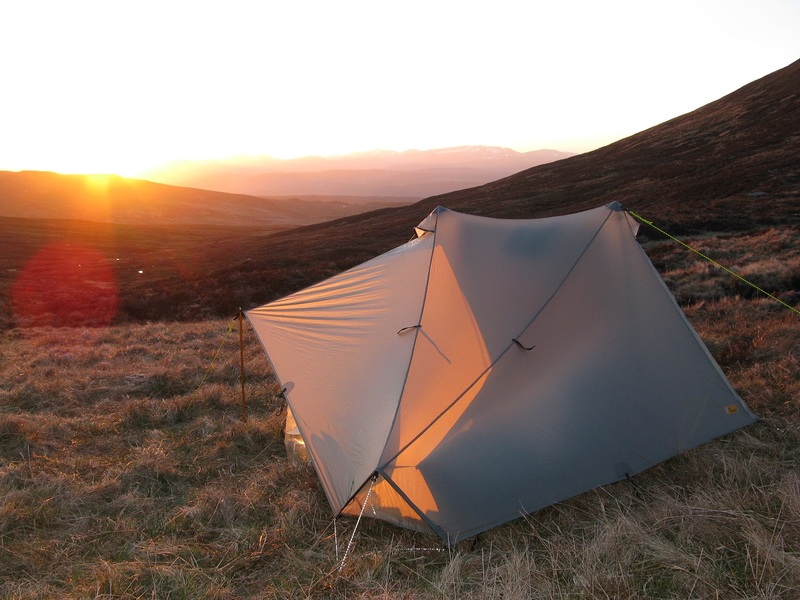 This would set me up nicely for the next days climb over another four munros, and just below the bealach was the perfect spot for the night on a small patch of grass. Sheltered from the wind coming from the SE, with water on hand and a long uninterrupted view looking west as the sun set….it was a great evening. So good in fact that I had an evening stroll up Beinn Dearg, and easy Corbett which only took an hour there and back from the tent. Once back I sat outside until well after 10pm watching the sun go down and drinking tea and whiskey, until I realised how cold it was getting with such a clear sky. It would be a long cold night ahead too. I’m not sure how much sleep I got overnight, but it wasn’t much. I certainly used all my spare clothes and down duvet jacket, but it wasn’t until I opened my eye’s at 06:00 that I realised how cold it had been. The tent was covered in a thick layer of frosty ice inside and out. Even with the doors open all night, the air was so still that moisture from ground warmed during the day had risen and immediately frozen on the tent. I had that horrible decision. Do I wait until the sun comes up and starts to warm things a little before getting up, or risk the inside of the tent becoming a shower as it does so. I got up just as the first drip started. Somebody please remind me that it’s May ! As soon as the sun hit the tent it was a battle of speed to wipe the flysheet down and stop the inner getting soaked as the frost thawed. 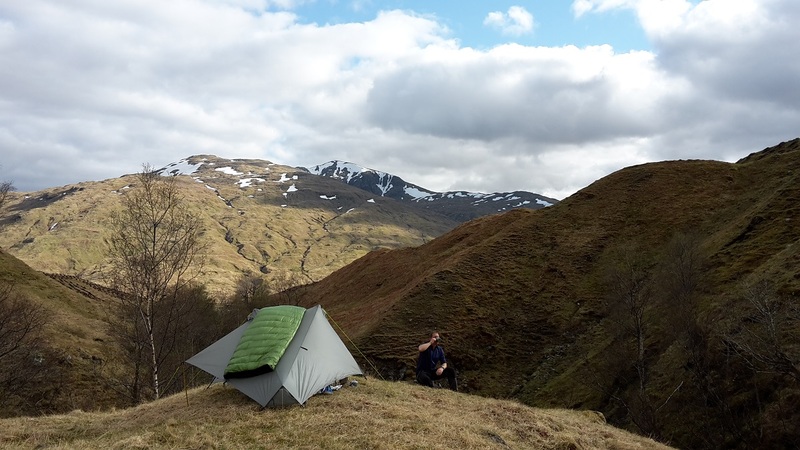 Camping high (650m) meant I was well set for the days munros, and again once up there you simply romp over them. A little more slowly perhaps than the Bridge of Orchy Munros as the wind had picked up again and it was getting distinctly colder. First there’s a scrambly climb up from the bealach over loose scree, then a long broad ridge gently climbing up to Carn Gorm. There wasn’t much mucking about today, or hanging around. It was bitterly cold and the weather looked like it would break at some time during the day so I was keen to get as many tops done and get down as quickly as possible. From the top of Carn Gorm you an see the entire days route over Meall Garbh to Carn Mairg. 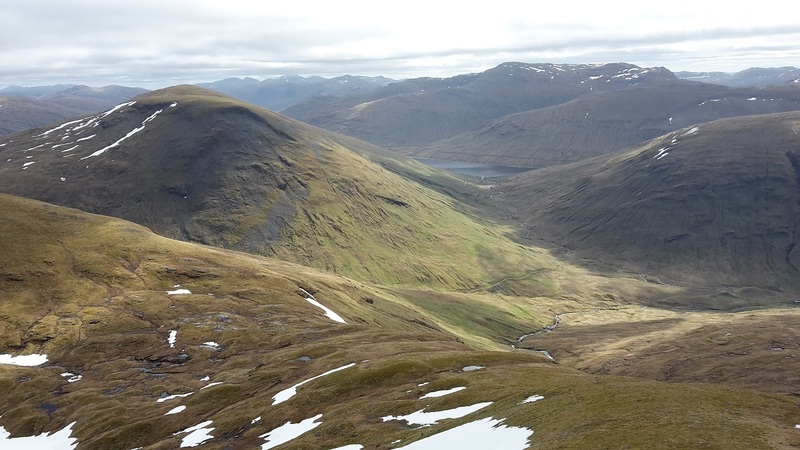 It looks a long way when you first see it but it’s all good marching territory and the munros come fairly gently. 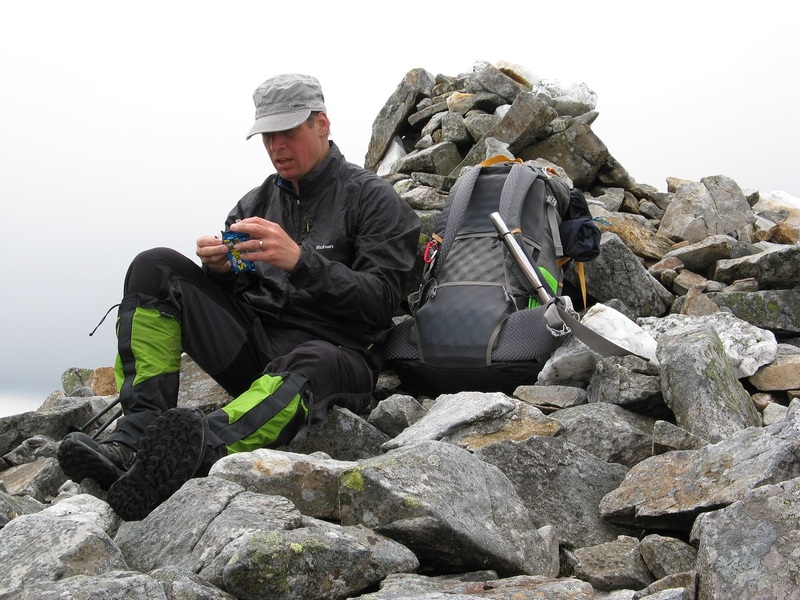 At Carn Miarg I quickly took in the additional satellite top of Meall Laith and then sheltered at the summit cairn for a snack. By now I was glad I’d be turning north just to get the wind behind me and warm up a little. There’s actually four Munros north of Glen Lyon but one is quite a way off route so I made do with bagging the first three. Turning my attention north I could see my last munro of the day, Schiehallion. The weather was on the turn so I wasn’t sure if I’d get it in, and there’s 5km of rough trackless ground and peat hags between the two. Slow going. About half way across there’s what passes for a shelter at Geal Charn. It wouldn’t win many ‘Visit Scotland’ accommodation stars, but it was good to get out of the wind and have some lunch in relative warmth. 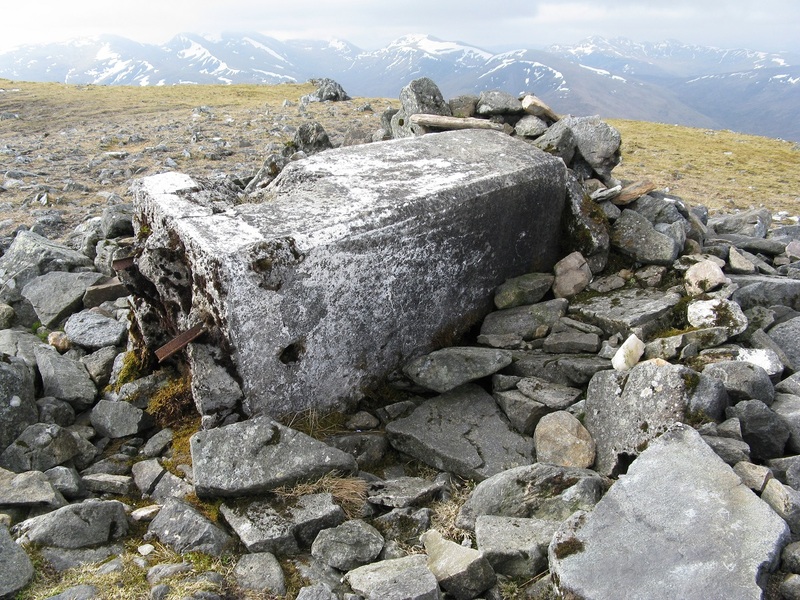 Shelter at Geal Charn. Let’s just say this one’s a bit basic. From there my intended route up Schiehallion certainly wasn’t the conventional one from the east, but straight up the steep and scree laden west end. It had looked a bit of a calf burner from a distance, but once there it was actually quite a doable and swift way up, if a little tiring and exposed to the wind. And I didn’t linger about on top long either as the weather was about to break. I made a swift descent down the usual ascent track to the east, over rocky ground, passing Chris Townsend on his way up. Just as I reached the bottom at Braes of Foss the heavens opened. 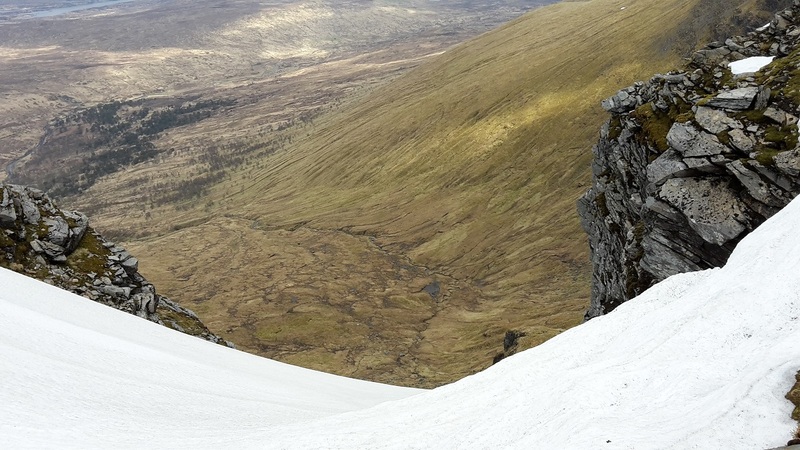 Not the normal way up Schiehallion…steep and loose. 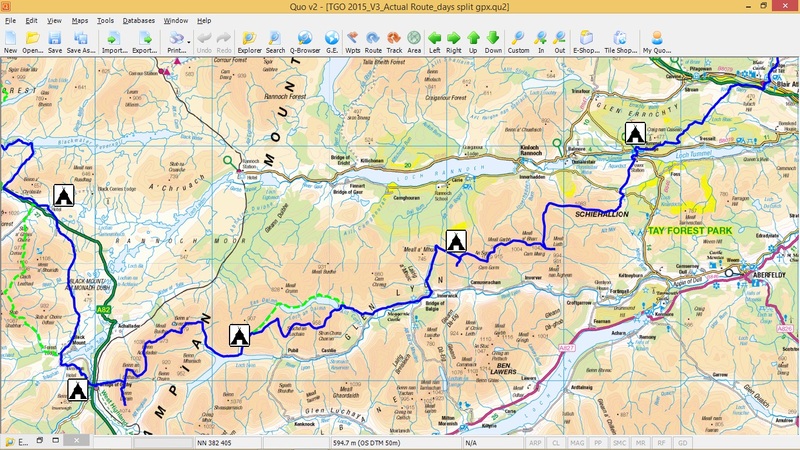 There’s no easy way from Braes of Foss to Tummel Bridge though on the map it all looks tame enough. I struck across Creag Kynachan, and as Martin Rye had pre-warned me it was nasty. Knee to thigh deep heather, strewn with ankle breaking holes and bolders. It was a crazily tiring little descent down. Once in Tummel Bridge I knew that the campsite wouldn’t take tents (I’d pleaded unsuccessfully by email several weeks before), but the campsite does at least have a well stocked shop and a bar which they let you use. 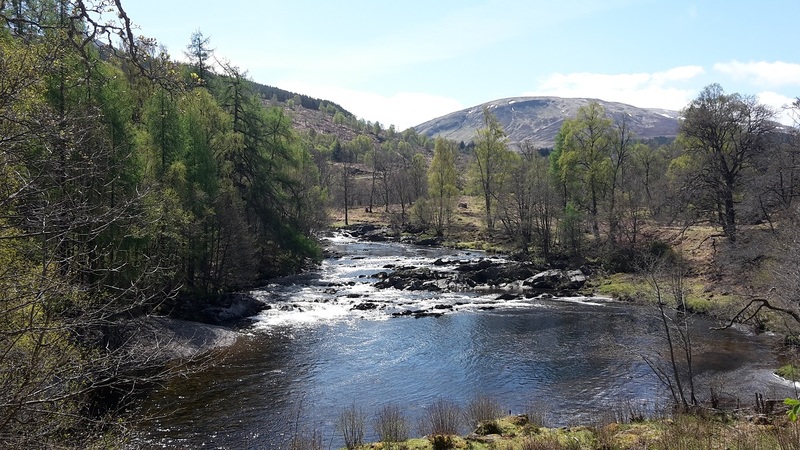 I had a couple of ales and then went to find a spot to camp in Tummel Forest. I found a great one on a comfy deep bed of bracken with a view back to Schiehallion. Today was always going to be an easy day, there’s only really one obvious way to get from Tummel Bridge to Blair Athol and that’s along easy tracks through Tummel Forest. It’s a pleasant little mornings walk on a narrow path through traditional birch woodland to begin with, then forest tracks between spruce. But the views really open up once you start to leave the cover of the trees and the lovely little loch comes into view. A very tranquil setting, would have been a great spot for lunch. There’s also a pleasant and easy descent down towards Blair Athol through braken with distant views of Blair Athol Castle, though after over a week when the only vehicle I’d seen was a Royal Mail van, the sound of the B8079 came as a bit of a shock. Thankfully as soon as I’d crossed the road and disappeared into the trees on the other side all was quiet again. 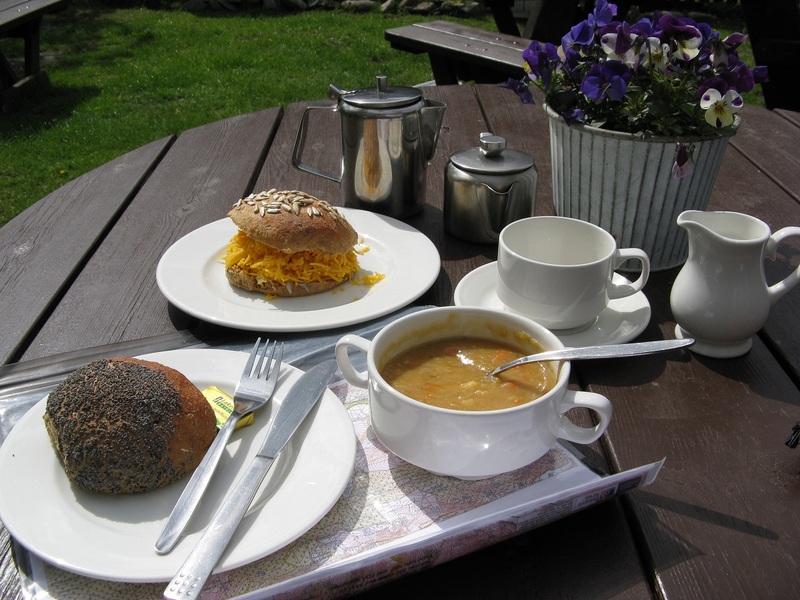 Blair Athol offered another chance for a café lunch, this time at the Watermill Tea Room. Sun, homemade soup and a pot of tea. Who could ask for more ? OK, I’ll admit it, it’d been five days since I’d had a beer so I followed that with a couple of pints of locally brewed ale at the Athol Arms Hotel while I plugged my phone it to charge it. Had the days fallen a bit differently I think Blair Athol would have been a pleasant place to spend the evening, but I needed to get part way up Glen Tilt that afternoon to set me up for the next day. Besides, it was a beautiful afternoon, perfect for wandering slowly along at an easy pace. It was nice to be able to amble for the day and not push myself. Blair Athol……a pint of ale at last. So that’s what I did, along the quiet lanes to Old Bridge of Tilt then high along the side of the Glen, past the rifle range and on past Marble Lodge and the Forest Lodge. Very easy walking indeed. All the while I was conscious that at some point the next day I’d have to cross the River Tilt to head East, and looking down at the raging water that was looking unlikely. I just had to hope as I walked higher up the Glen beyond where the bigger tributary streams entered, that the amount of water would decrease significantly. It looked like a vein hope after all the rain. The wind also picked up again along Glen Tilt and it’s not the most sheltered of tracks, in fact a bit of a wind tunnel. I pitched as soon as I found a sheltered spot by a small waterfall a few km before the Falls of Tarf. Tomorrow it would be back up into the hills and the possibility of a couple more unplanned munros. Wish I was as fit as you! It was a Challenge where the weather and routes needed to match up. Bad weather stopped me going high on two days. You’re not wrong there Robin. If my only planned high days had been days 4 & 5 then I’d have had to abandon most of the tops. As it was I pretty much planned two routes all the way across, with 11 Foul Weather Alternatives. Both routes were planned so that even if the weather was bad the route would still be interesting. 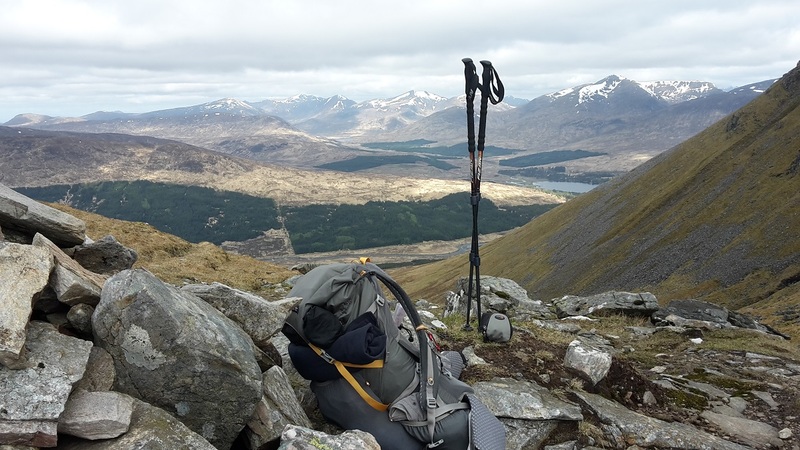 As it was I only had to drop 6 munros on the FWA’s I took, but then picked off 8 I hadn’t planned later on. As for fitness, it’s one of those creeping things, I’m paranoid about letting it slip. Somebody once told me that if you let your fitness slip through your thirties and forties it’s a real challenge to get it back. I’m fast approaching fifty so hopefully that’s job done now. Fitness? It’s even worse if you let it slip between your TWENTIES and fifties, John! Cheers Stuart. Yes it was a real shame about the WHW Sleeper. It’s had mixed reviews lately but it doesn’t help that you have to book ahead even if it’s empty, and you can only pay via bank transfer ! You can’t just turn up. I got the distinct impression that they only come to clean it after being occupied if there are people booked in for the following night, otherwise it’s left to fester. 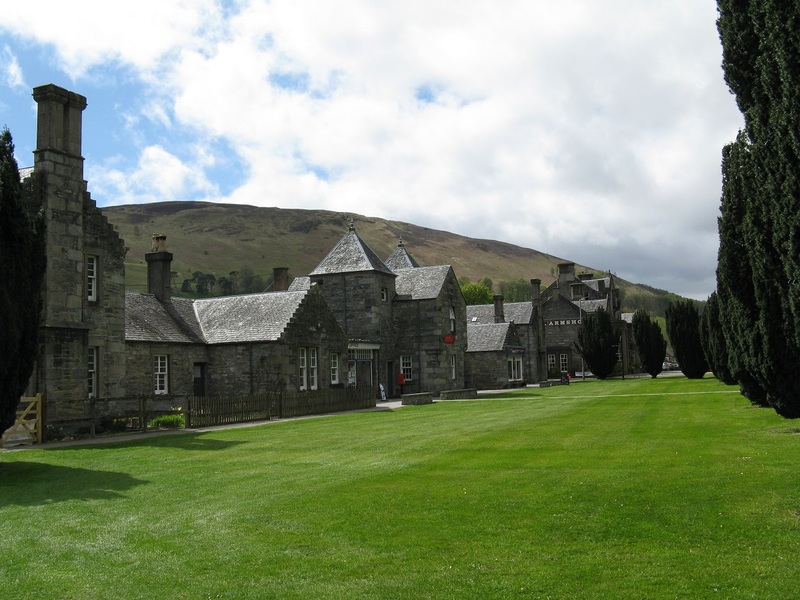 A real shame, especially since the cheap bunkhouse at the Bridge of Orchy Hotel was torn down a few years ago. Weather was pretty mixed this year. Three days of really bad weather (rain, hail, sleet, high winds), and although the on the other days the air wasn’t particularly cold in shelter, there was a biting cold wind at times. I think with the TGO you have to be very flexible and just roll with it. Tremendous route and bagging supplementary tops to boot! Many thanks indeed Alan. I think I was just on a roll with enjoying it so much. Can’t beat walking with a grin, gives you a boost of energy. 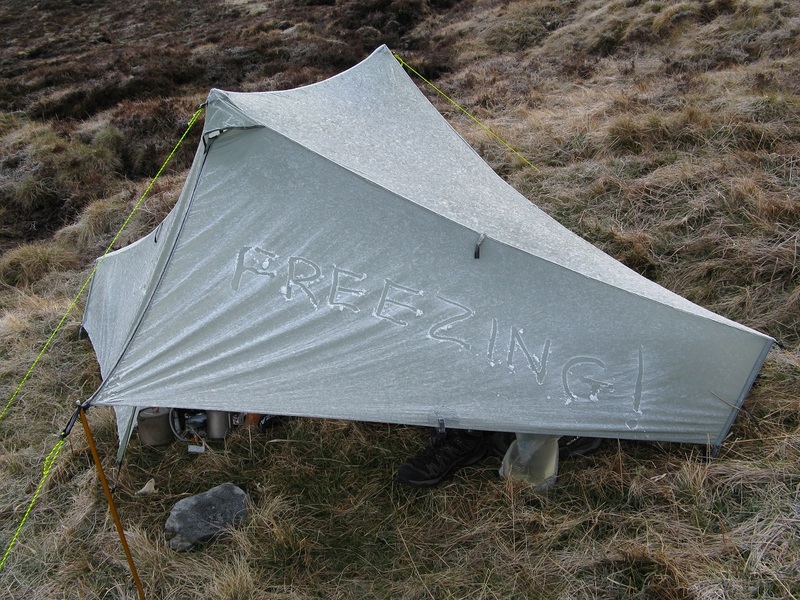 Had to laugh at the word “freezing” on the tent! Despite the weather, the scenery looks beautiful and the sense of achievement would have been great, I’m sure. Exhilarating! That delicious looking hot meal would have been rapidly consumed I guess. Great pictures of a wonderful challenge. Kinlochleven through here I didn’t meet a single other challenger. In fact I met only one other person at all in the hills all that time. Very tranquil. Another awe inspiring read, John. The contrast between Days 5 and 6, both weather and walking, was incredible. And what a pitch you found on Day 6. So spectacular. It was a bit of a clamber to get to that camping spot, but was like being on your own little headland once you were there. Waterfalls and cascading steams on three sides and a great view. Couldn’t resist it when I spotted it. 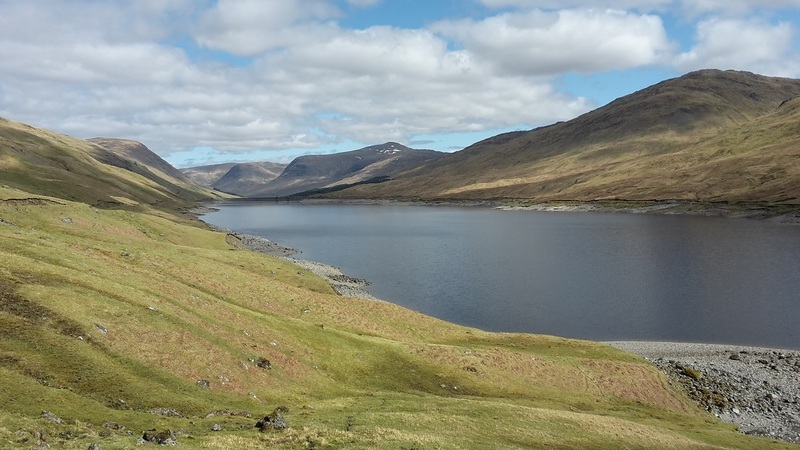 It looks like there’s a forest about to be planted on the north side of Loch Lyon, so enjoy it while you can as the scenery will change a bit. 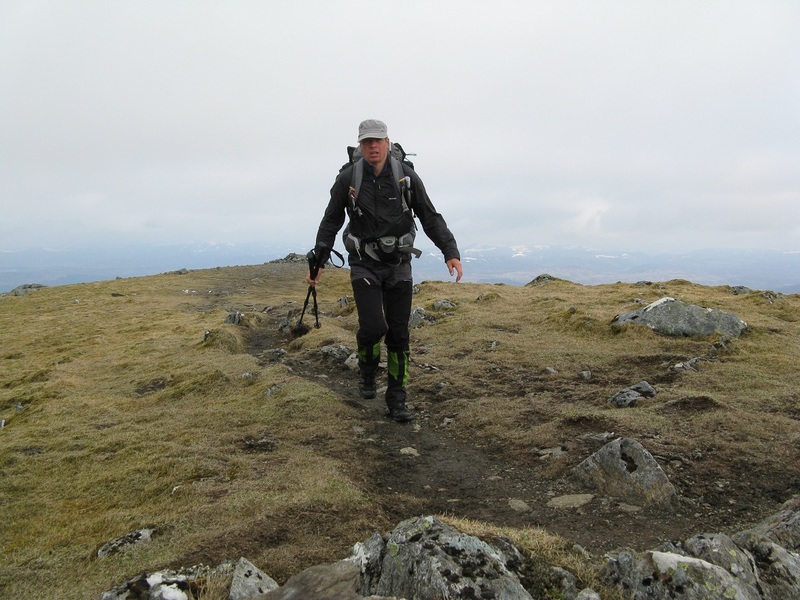 As for the Bridge of Orchy munros……all I can say is do them. If only for the view over Rannoch. Attempting my first TGO Challenge in May. Came across your blog while trying to find somewhere to camp around Loch Lyon. Was going to just walk along the north shore of Loch Lyon but like your camp and the look of the route from Chnapanaich to The Stuic. 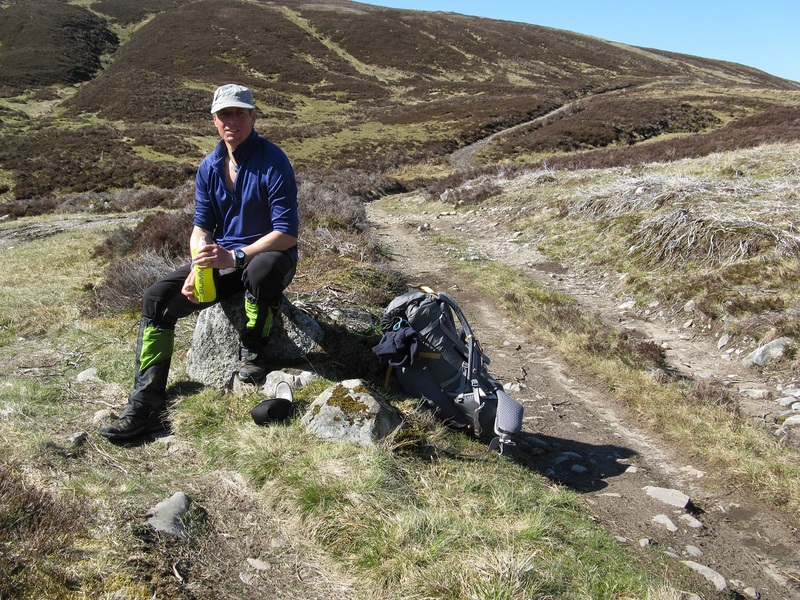 Hi Scott, that day and a half from Bridge of Orchy to Bridge of Balgie was an absolute joy. 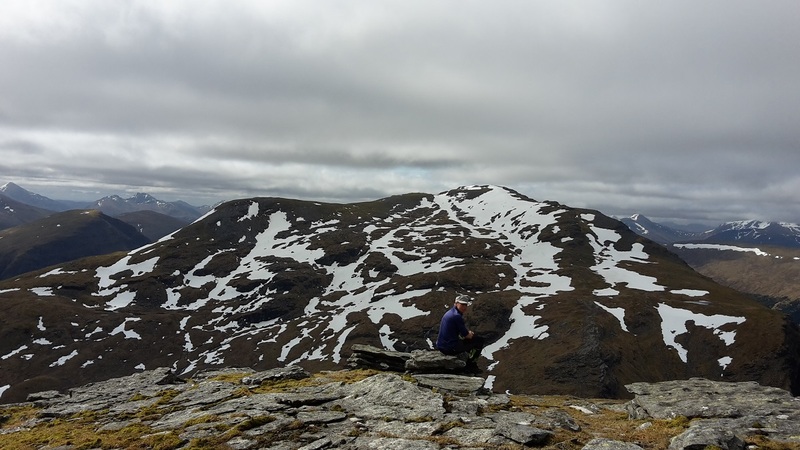 Don’t be afraid of setting your main route high over the munros from Bridge of Orchy as I did and leaving the route along Loch Lyon as your FWA. It’s surprisingly easy to gain the tops from Victoria Bridge and once you’re up there the tops come easily and the views are to die for. Even if you stay low, I’d be tempted to head directly east from Bridge of Orchy to the bealach between Meall Gharb and Bienn An Dothaidh, and then drop down to meet your planned route in Glen Kinglass. It’s a very easy short climb up over that Bealach. That camp spot just off Loch Lyon on the way up towards Chnapanaich was superb, and a lovely spot. It’s a bit of a scramble to get to across a little ravine, but you need to cross here anyway. To get there leave Loch Lyon the other side of a bridge over the Eas Eoghannan. From here you have to pick your way north on the east grassy bank above the stream (lot’s of new tree planting here). The camp spot will come into view as the stream splits by some rapids. The route from Chnapanaich is superb, though getting to it is a bit of trudge. It’s completely trackless all the way from Loch Lyon and once at the bealach east of Meall Phubaill you will need to contour round. There’s then an area of peat hags before the short climb up to Chnapanaich. From the top the route is then easy and the views down Loch an Daimh are great. And after all that, the Tea Shop at Bridge of Balgie is the icing on the cake.